We’ve made Jamie Oliver’s take on this classic but this version is much superior. 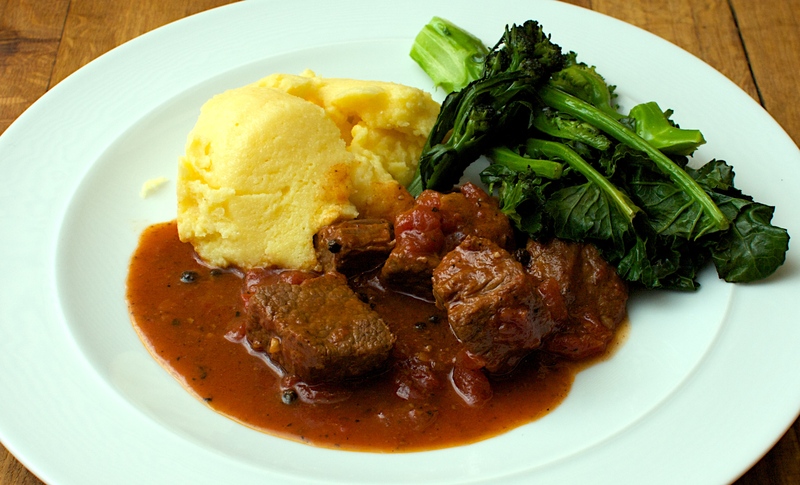 Peposo is a Tuscan beef and peppercorn stew. We also cooked polenta to serve this time which is a superb accompaniment and takes about the same time to cook as the stew. Don’t be put off by the massive quantities of peppercorns, they soften and give a warming rather than fiery spice kick. Heat the oil in a heavy casserole. Season the beef well with salt, and brown well over a medium heat for about 15 minutes. Only turn it when the bits touching the pan have gone really brown. Add the onion and garlic and garlic and cook for another 10 minutes or until they are well softened. Add the whole and ground black pepper and the bay leaf and fry for another minute before adding the wine and tomatoes. Taste for seasoning and bring to a simmer, then reduce the heat to very low and cook, covered, for 1½ hours or until the meat is really tender – check again for salt when it’s ready. Serve right away with the polenta below or with some bread and cannellini beans or roast potatoes. Or you can refrigerate and reheat when you need it. Leftovers make a good sauce for pasta. This takes ages to make so if you get it on just after your Peposo it should be ready at about the same time. This recipe uses coarse yellow polenta, don’t be tempted by the easy-cook stuff as it is not the same. Bring the water to the boil with the salt. Add the polenta in a steady stream, stirring like mad with a wooden spoon or whisk to avoid lumps. Simmer for 90 minutes, stirring often with a wooden spoon, until thick and luscious. You should almost be able to stand the spoon in it, but add water if you actually can at any stage during the cooking. When you like the texture, stir in the cheese and butter. Leftovers can be reheated by stirring over a low heat with a little water. Wine Suggestion: Regional foods are generally complemented by the wines of the same region so go for a really good Chianti that will be able to stand up to this rich stew. We had a Felsina Chianti Classico which was delicious.